As looper larvae commence feeding on fruit, close monitoring during early fruit formation is critical to avoid damage. The looper is a native insect occurring across Australia, Norfolk Island, New Caledonia and New Zealand. Apple looper has also been recorded feeding on acacia buds and petals, apples, cherries, sunflower heads and buds, St John's wort, goatsbeard, clematis and roses. Adult moths are about 8mm long, with a wingspan of 15mm. They are mottled grey with brown bands across the wings. Moths are roughly triangular when at rest: male moths have tufts on the leading edge of the forewing (see above). Apple looper eggs are off-white, spheroid, and laid singly. They are probably laid on or near flowers and fruitlets. Larvae are typical loopers with six legs (true legs) on the thorax and legs on the end of the body (prolegs). They characteristically loop as they move. Mature larvae vary from green to mottled brown. When mature, they are the thickness of a match and about 20mm long. After spinning a light silken mesh net, the mature larva moults to a brown pupa within the canopy. Damage is caused by caterpillars feeding on immature fruitlets, resulting in scabs that renders fruit unmarketable. There is little sign of feeding on leaves, so it is important to examine fruit closely during early formation to detect an infestation to avoid high losses. The insect is regarded as a spring pest of apples. During spring to early summer in 2008, apple orchards in the Manjimup/Pemberton region suffered apple looper infestations of much greater severity than usual. The proportion of fruit damaged was estimated at 10%, but much was removed during fruit-thinning in late spring and early summer. It is not known where looper eggs are laid, but after hatching grubs commence feeding on small berries. No leaf feeding is obvious in infested vines. Apple loopers reduce yield by feeding on fruit and fruit stalks within bunches. As with apple orchards, it is important to examine fruit closely during early formation to detect infestation to avoid high losses. Feeding within grape bunches varies. Larvae bore holes in the side of the berry. When berries are small, this feeding kills the berry. With larger berries grubs gouge out the side, leaving a scar. They also feed on the pedicel just below the base of the berry where it is attached to the bunch. The first reported berry damage in Western Australia was in December 2008, the first record in vineyards. It is thought that very unusual weather in spring 2008 (temperatures lower than average, rainfall at or above average) contributed to a higher population than usual of apple looper in orchards and vineyards. This may have produced more favourable conditions in the native habitat of apple looper from where they could invade nearby orchards and vineyards. 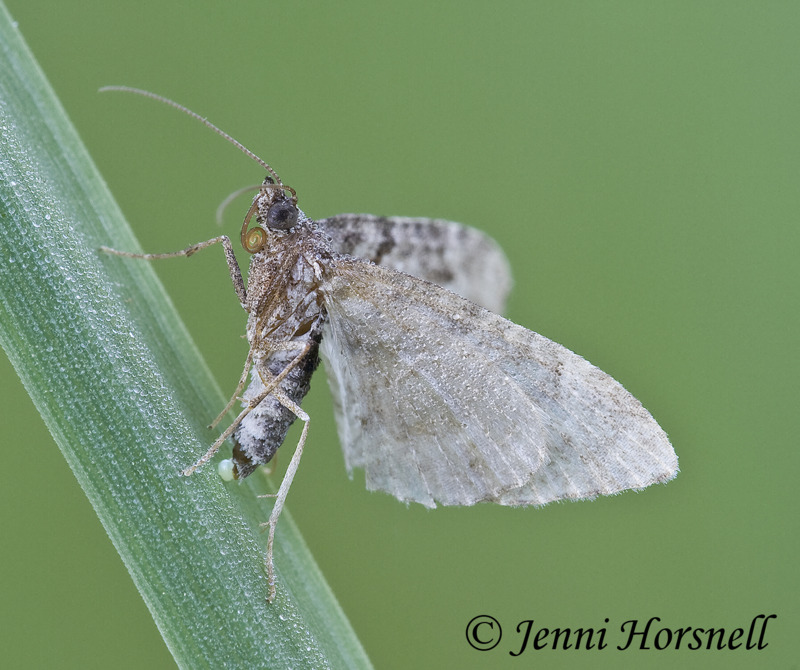 The small and relatively frail moths are unlikely to be capable of long-distance flight. The highest levels of looper damage to grapes have occurred in the Margaret River region from Carbanup to Karridale, where approximately 30% of vineyards were affected in the 2008/09 season. Lower levels of damage occurred in the Manjimup/Pemberton region and as far east as the Porongorups. The extent of the infestation is further evidence that the looper is a native species of widespread occurrence in the South­ West of Western Australia. Damage to grapes in infested vineyards ranged from none or low to severe. Low or no damage was observed where the larvae appeared to restrict their feeding to berries that had failed to set - probably due to adverse weather. With spring being moist and cool over an extended period, fruit set was low in some vineyards and grubs seemed to prefer feeding on the small unfertilised green berries. As berries grow they seem to be less likely to be attacked. Within infested vineyards, the level of damage varied with variety. In general, the earlier flowering varieties such as Chardonnay had little damage. Later flowering varieties such as Sauvignon Blanc and Semillon suffered greater damage. In one block of Semillon, fruit loss was recorded at an average of one-third. Within this block, one panel had a quarter of bunches with all berries killed and 90% yield loss overall. Berries damaged when small are obvious within bunches as dried, dark brown fruitlets that are likely to fall. Larger damaged berries remain in bunches. With damaged skins and an increased likelihood of moist conditions near vintage, such berries pose a threat as sources of disease occurring within bunches. Given the circumstances of apple looper as a pest - moths being relatively non-descript and larvae feeding mainly on fruit - monitoring to prevent damage to crops is a challenge. Identifying and synthesising a pheromone to monitor moths would be an advantage. Because fruitlets are the main food for larvae, it seems moths are attracted to flowers and monitoring should commence at this stage. Unfortunately larvae are not easily dislodged from the canopy, so tapping over a tray or icecream container is not practical. Inspecting apple fruitlets and developing grape bunches carefully for looper larvae or early signs of feeding is the best method. As a native species, apple looper would be expected to have a suite of natural control agents. Rearing field-collected larvae confirmed the presence of at least one species of wasp parasite. The role of natural control agents such as predators and parasites is likely to very limited in protecting grapevines or apples. Products registered for use in grapevines and apples against lightbrown apple moth and grapevine moth may be applied to control apple looper under changes to pesticide Regulations administered by the Health Department of Western Australia.